This view of part of the North or Grand Parade was taken from the opposite side of the River Avon, near the newly built Pultney Bridge. The parade was planned as an extension to the city, on a marshy plot of land leading down to the banks of the River Avon. After the drainage of the site was completed in 1740, work was begun on the houses. The Palladian scheme for the Parade was designed by James Wood the Elder. 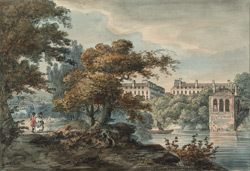 The artist is William Payne (1760-1830), one of the most fashionable and successful drawing masters of his day, who developed his own pigment known as "Payne's Grey".